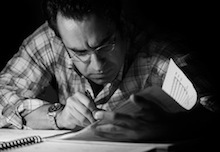 Diego Navarro is a Spanish composer who composes, orchestrates and conducts music for Film & Television. After his initial self taught years learning the piano & guitar, he began his official studies at Tenerife’s Santa Cruz Conservatory then continued studies in London and at the Berklee College of Music in the USA. He received the Advanced Certificate in Piano with the Associated Board of the Royal Schools of Music in 2000. He has written the scores for 6 feature films including cartoon feature film TIME GATE (PUERTA DEL TIEMPO) the nominee for “Best Animation Film” at the XVIIth edition of the Goya Awards, LOOK AT THE MOON directed by Eduard Bosch and produced by prestigious Elias Guerejeta, OSCAR: THE COLOR OF DESTINY, a drama-biopic about the surrealist painter Oscar Dominguez, EL CLAN directed by Jaime Falero and the horror film MIMESIS directed by American director Douglas Schulze. Diego is beginning work on MIMESIS 2 with Douglas which will be released this 2014. Diego is director and the father of the Tenerife International Film Music Festiuval (FIMUCITE) which started its first edition in 2007 obtaining great success – http://www.fimucite.com. He has conducted music of legendary film composers John Williams, Jerry Goldsmith, & Bernard Hermann, to name a few. In addition, he has been a guest conductor at the Cracow Film Festival for the past 3 years. Diego is a member of Spain’s Film Academy, SGAE, the Association of Composers for the audiovisual, the A.I.E. (Spanish society of artists and musicians) and ProMusic – Association of Professional Musicians of the Canary Islands. In 2005, Diego created The Tenerife Film Orchestra & Choir (TFO & Choir) which is the 1st Spanish orchestra devoted to the recording of film music. He is the Artistic Director & Recording Producer of the orchestra which he proudly uses for his award winning Film compositions.